The Map: Find that perfect sample faster. Atlas’ AI can find every drum sound on your computer and create a map you can scroll and zoom with all your samples in one place. Instant Drumkits: Find inspiration in randomization. One click and Atlas chooses 8 samples. Lock or hotswap them individually. Rinse and repeat. Tweak how they sound using the combo controls. 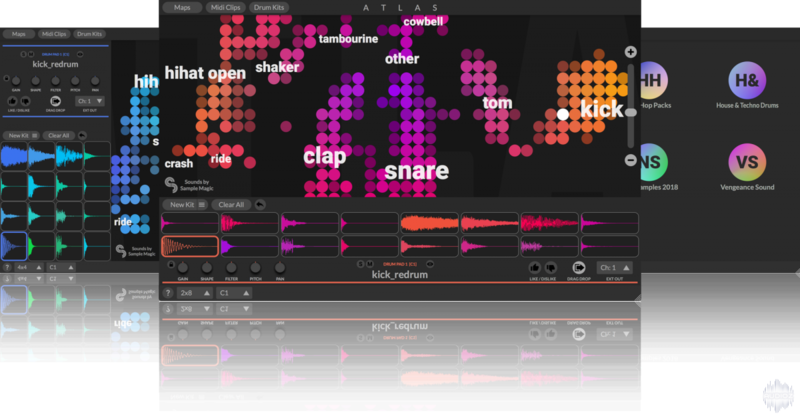 Drag and Drop: Drag and drop samples from Atlas to your favourite sampler/sequencer for more control. Atlas can be used as a replacement browser for your existing workflow. Bundled MIDI Clips: Make inspirational drums in seconds by dragging included MIDI patterns from Atlas into your DAW as MIDI will trigger the drum kit. Spam “New Kit” for instant drum loops. Like/Dislike: The more you use Atlas, the more it gets to know you. As samples are liked or disliked, Atlas learns the styles of samples you prefer and helps you hone your sound. Analyse your own samples: Analyze any of your own sample packs regardless of size. Create seperate maps for genre, brand, style or however you organise your samples. Analysis happens locally, not in the cloud. Atlas comes with a ‘Welcome Pack’ of samples hand picked from the Sample Magic collection. These samples have been recorded from a variety of drum machines, studio recordings and other sources and with custom layering and processing, sound great in any style of music. This release has been exclusively provided to AudioZ by our anonymous reverse engineer. Algonaut Atlas v1.4 FiX WiN X64 has been exclusively released on AudioZ by PiRAT who chose to ask not to post mirrors. Atlas was the Godfather, XLN is a clone with presets added Capisce. The first ones to do this AI organization of sound in this type of map form were "The Infinite Drum Machine" by Google in 2017. Algonaut took this idea and developed it in to a Virtual Instrument about a year ago. XLN XO came out with this only about a week ago. As of right now I would say XLN is on top because of the extra options and midi editor. However Atlas runs a lot smoother and the interface doesn't feel so congested. Atlas is also adding the midi editor and a lot more functions in their biggest update of 1.5. They already have v1.4.1 on their homepage and this fix is still for 1.4. Is that so? Thank you, anonymous reverse engineer! No changelog for 1.4.1 there though at the monent. of course XO is way better. XLN rules. No, it's about the principle. I wanted to read it from the two guys. If someone says that something is better or someone says that something is wrong, without saying why it is, it has absolutely no value. Only those who bought this say it's better than XO . It's visible from the moon which one is better. i tried it in teh last days, but i still find it less useful sincem I already have sorted all my sounds into folders. It would be way more usefullif it could do a more finegrained sorting by attribute like metallic, harsh soft. I think this came first, but I much prefer the layout and sequencer of XLN. To each his own, though. No matter where it was launched. The first 1.4 is still working ok for me on a offline pc ? that i take a lend off just to test. Thanks "mono" it worked for me-I used your dll. and refreshed FL but when it loaded FIRST it sayed TRIAL EXPIRED -so I loaded it again on top of it and it WORKED !!! !---I did it Offline for SAFETY but "BAM" there it was --Just load it on top of the first one ---maybe thats the fix ?? Maybe is just a bug lol just messing. as well as refreshing the plugin in fl studio like you did.